All PostsHealth & FitnessOrganizeHome / All Posts / Meal Prep … What is it? & How I am going to help you! Meal Prepping… You hear these healthy people talking about it all the time, but what is it?? Meal prepping is just a fancy term for making a boatload of food and having leftovers for the week. The key is making healthy food. You want to make a bunch of healthy food so that you set yourself up for success for the week. You’ve all heard it before… Preparation is the key to success! By preparing a bunch of healthy meals in advance you are setting yourself up for success. When you are too busy to cook, guess what … it’s already done for you! No more poor choices and fast food because you already put in the work and all you have to do is reheat! HOW I AM GOING TO HELP YOU MEAL PREP! My plan is to help you with your weekly meal prep planning. Every Friday I am going to post a video about what I am planning to make for the upcoming week. That means I have already done the work for you and gone through all of my recipes and picked out healthy options. You can then head to my blog to find all of the suggested recipes. By posting these recipes Friday, that gives you time to go grocery shopping (I usually do this Saturday morning) and then cook all day Sunday! Make it fun! Turn on your favorite music (my go to is Hip Hop BBQ on Pandora) and dance around while you create delicious masterpieces! Later in the day, open up a bottle of wine and relish in the fact that you are going to eat healthy all week long! In case some of you want to know how I meal prep, I have included my weekly process below. 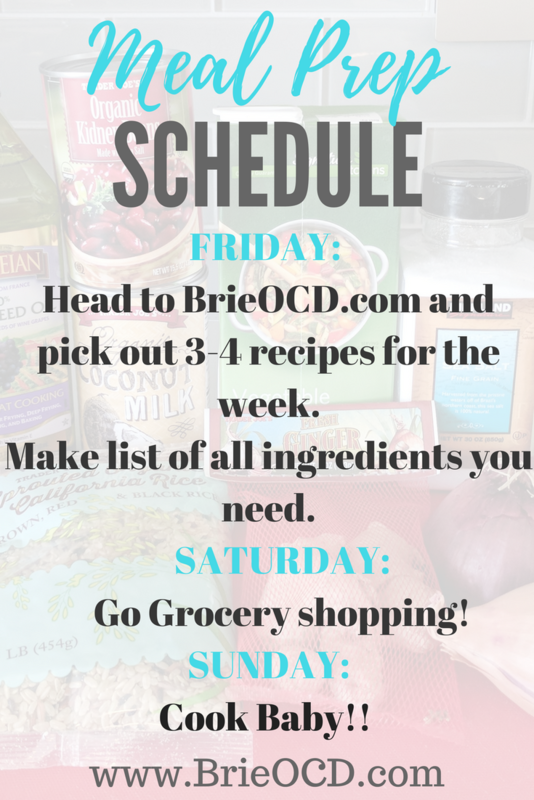 Friday: Go through all of my recipes and pick out 3-4 that I want to make for that week. Friday: Make a list of all of the ingredients that you need to make these recipes. I will usually pick out 3-4 recipes but a couple of those are recipes that I don’t necessarily make in advance (but I do buy all the ingredients in advance). Examples of these recipes are Avocado Egg Burgers with sweet potato fries, steak and tortellini, salmon with cauliflower hash etc. These are recipes that we will make fresh on the grill (or in the oven) on the night that we are going to eat them. Again, preparation is the key to success. Make lists and plan out exactly what you are going to eat for breakfast, lunch and dinner for the week. You do need to put in work in advance but I promise you, you will love yourself during your busy workweek that you have so many yummy, healthy recipes already made. Tune in every Friday for what recipes I am making for the upcoming week and head to my blog to find the suggested recipes and so much more!